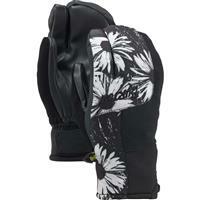 From Burton: The Burton Empire GORE-TEX® Mitt keeps you connected in ways no mitt can. The secret is its Screen Grab® enhanced Toughgrip™ palm. This Burton-exclusive PU synthetic leather has the tech built right in, meaning it will never fray, wear out, or wash off. Any device, any finger, you get total touchscreen control without ever exposing your fingers to the cold. A bestselling style that’s finally offered in a mitt at the team’s request, it’s all wrapped up in premium Thermacore™ warmth and the GORE-TEX® membrane backed by their GUARANTEED TO KEEP YOU DRY® promise.